Panelists Kedra, TJ, and Carol’s Teaching Session is no longer active. Kedra Holderman and her incredible herd of intuitive mustangs are located in the avocado countryside of Temecula, California. There, she and her family run Peaceful Hearts For Change, an organization whose mission is to improve health and wellness to all in need. Kedra has dedicated her life to healing and empowering people from all walks of life. y for help with battling drug addiction. 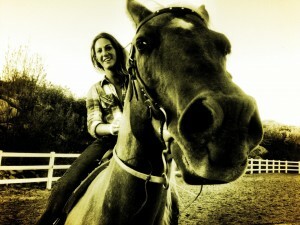 After short stays at different facilities, she found a program that featured healing with horses. There Kedra met two mustangs waiting to change her life. Thus began two years of learning through the eyes of horses. A few ye ars later, Kedra attended a Wild Horse Boot Camp at Livesavers Wild Horse Rescue in Lancaster, California, where wild mustangs recently rescued from a BLM auction were gentled so they would not be sold to kill buyers for 25 cents a pound. Four mustangs from that herd now reside at Peaceful Hearts Ranch, along with two other very special mustangs. Together, these horses form an incredibly powerful team dedicated to helping people heal and discover self-truths. Kedra is EAGALA certified and is currently working in partnership with the County of Riverside Mental Health Department and the County of Riverside Department of Public and Social Services to promote emotional health and wellness in the local community. Kedra can be reached at Peaceful Hearts for Change, or via email.